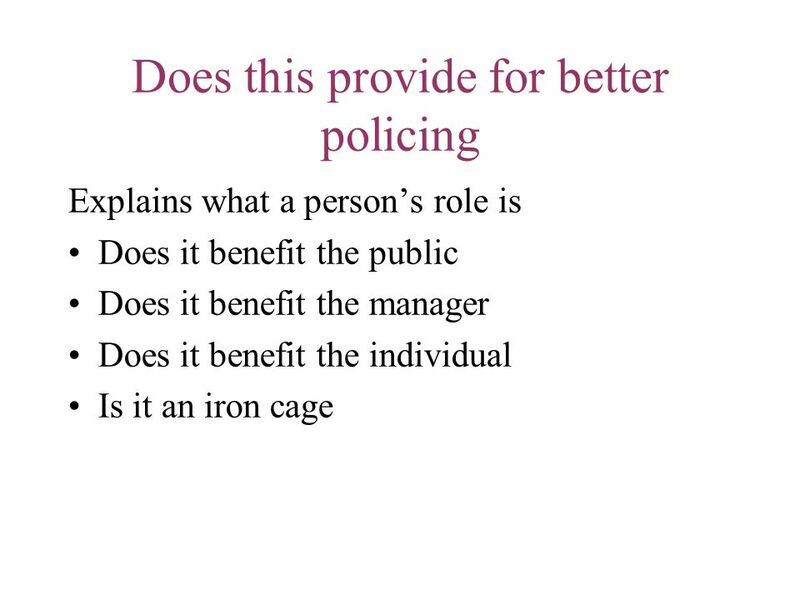 Professionalising the police service This series of slides has been designed to be adapted for various types of presentations to different audiences. All the slides might be used during a whole-day implementation workshop to help personnel and/or training specialists understand in-depth how to use the standards. A half-hour introductory presentation to senior managers might involve the following slides: 1. National Occupational Standards for Legal Advice 2. What are National Occupational Standards? 3. Why National Occupational Standards? 4. How were the Standards developed? 5. How can the Standards be used? 6. What do NOS for Advice cover? 7. What other NOS are available? 19. Benefits for Individuals 20. 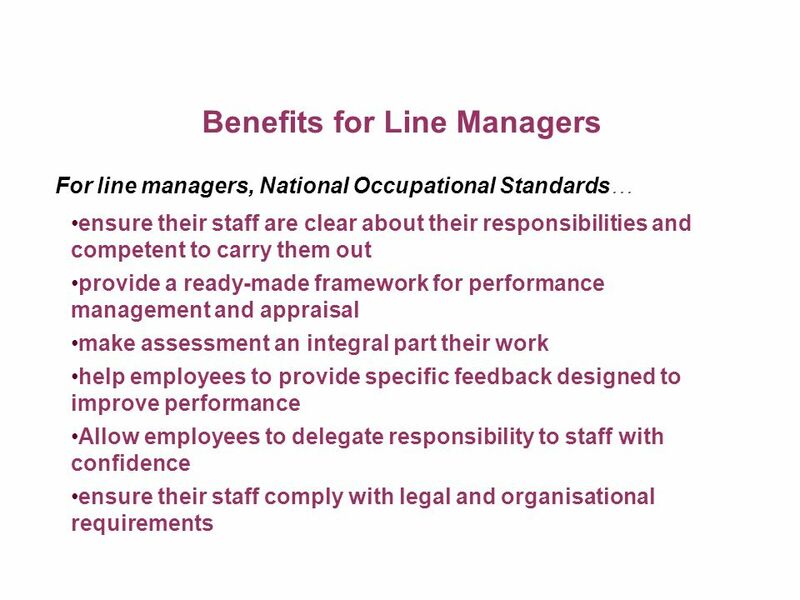 Benefits for Line Managers 21. Benefits for Organisations 22. 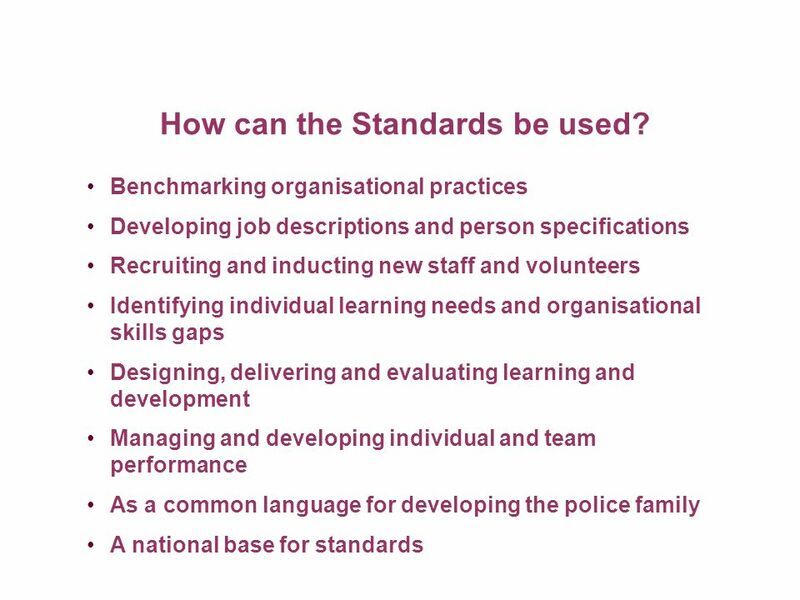 Further Information A half-day workshop to introduce staff and volunteers to the standards might involve: 8. 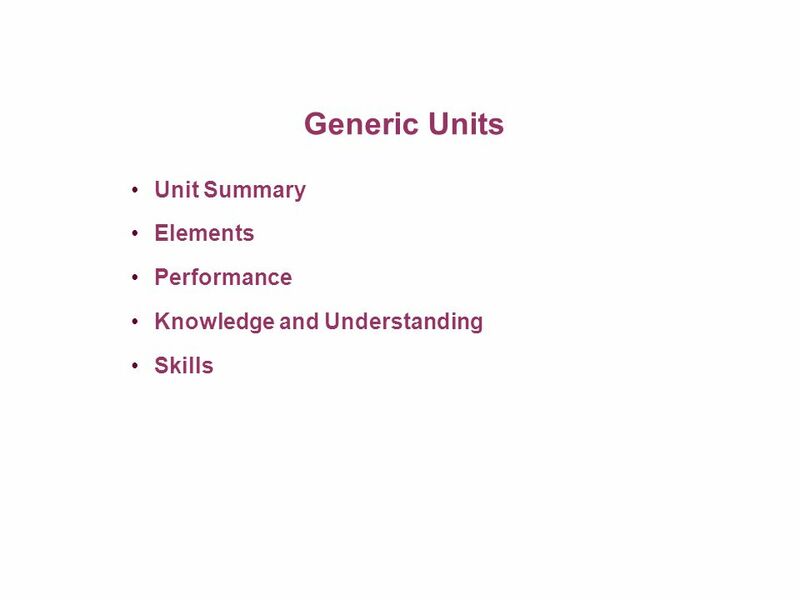 Generic Units 9. Knowledge Units 10. Levels of Knowledge Units 12. 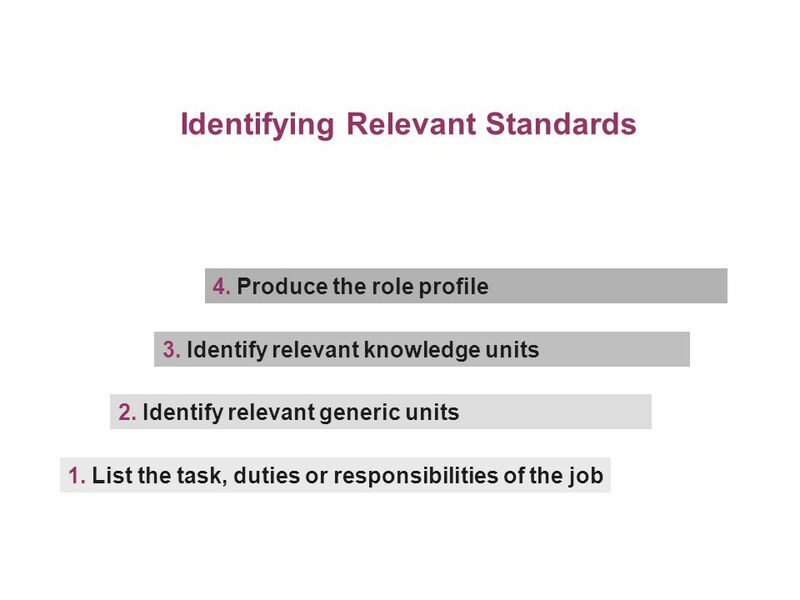 Identifying Relevant Standards Relevant role profile examples from slides 13-16 18. 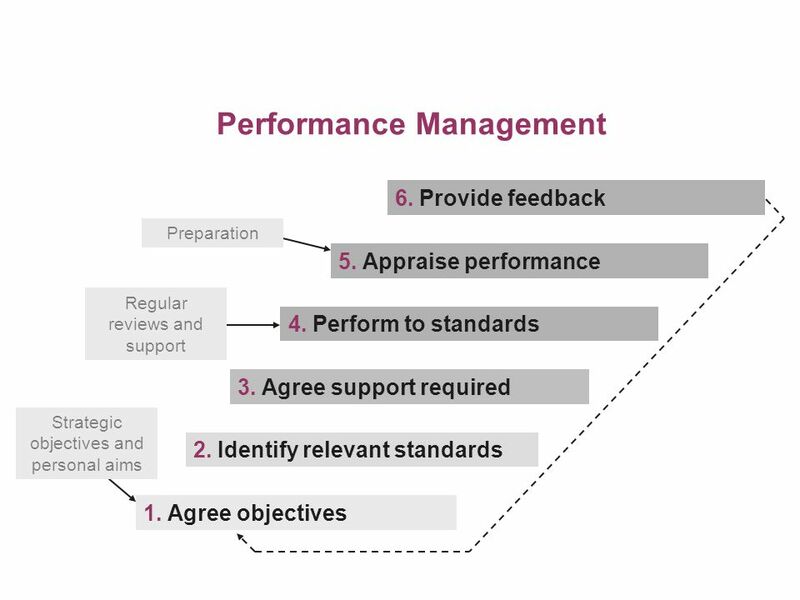 Performance Management A whole-day workshop to help line managers use the standards to manage the performance of their teams might involve: 17. 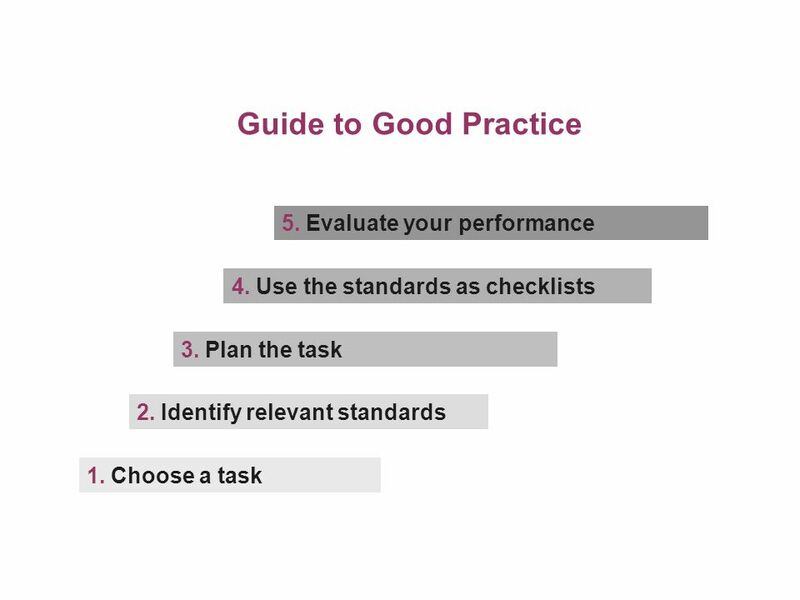 Guide to Good Practice Other materials required would include copies of the Legal Advice Standards and other relevant National Occupational Standards, and copies of the National Occupational Standards Toolkit for Legal Advice. Don’t forget to use Unit L19 Facilitate learning in groups through presentations and activities from the Learning and Development Standards to help you plan, deliver and evaluate your presentation. 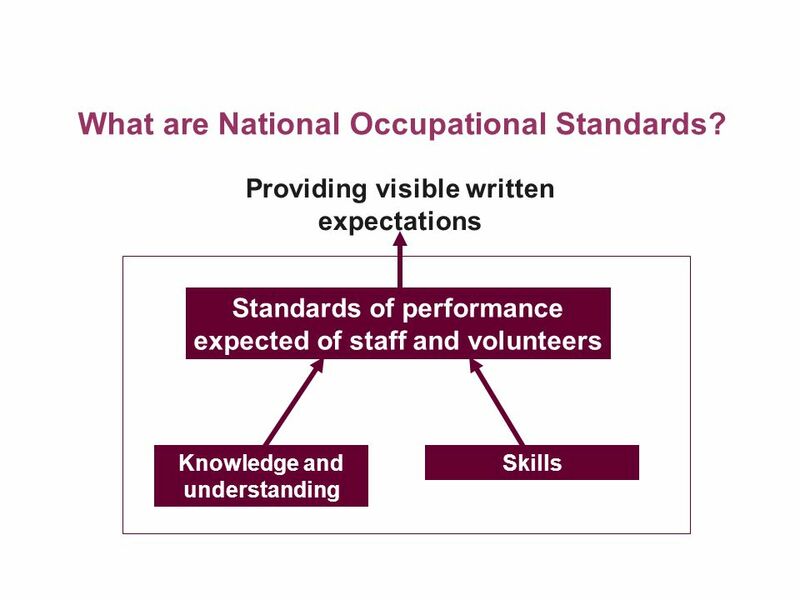 2 What are National Occupational Standards? Providing visible written expectations Standards of performance expected of staff and volunteers Knowledge and understanding Skills National Occupational Standards describe the standards of performance expected of staff and volunteers as they carry out their duties. These standards of performance have been established by researching effective practice in delivering independent information and advice in a wide range of organisations across the UK. As well as the statements of effective performance, the standards specify what the worker needs to know and understand, and the skills he or she needs, in order to perform competently. Working to National Occupational Standards will assure the delivery of high-quality, consistent information and advice across all organisations working in the Legal Advice field. 3 Why National Occupational Standards? Improve the skills of those working in the police family Create a more flexible workforce by enhancing the transferability of skills Create more coherent career development paths Raise professionalism The key drivers for developing National Occupational Standards for Legal Advice were: The need to improve the quality and consistency of legal advice provided to the general public The desire to create a more flexible workforce by enhancing the transferability of skills for staff moving within the legal advice sector The desire to create a more coherent career development path for the legal advice workforce The need to raise the profile of legal advice generally in order to: - encourage new entrants to the sector - encourage members of the public to access services The need to find a way to enhance access to funding support for the training and development of workers across the sector. 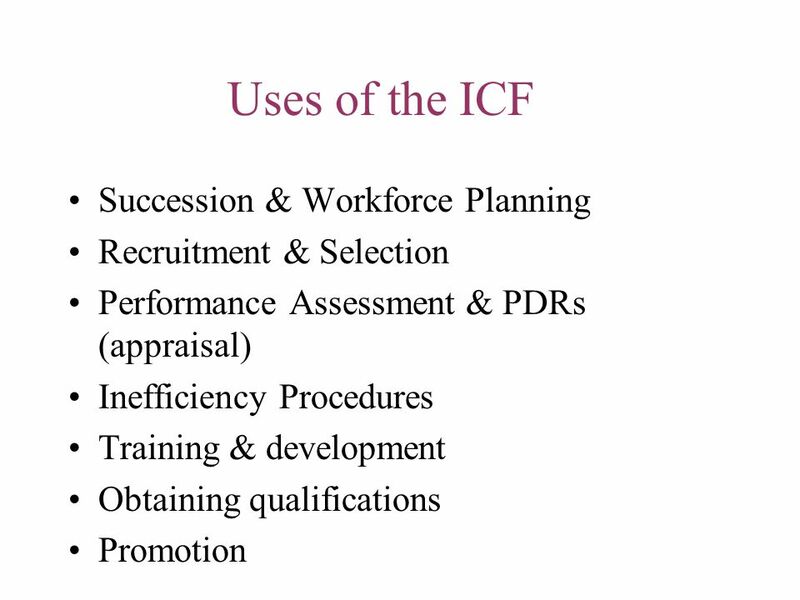 Recruitment & Selection Performance Assessment & PDRs (appraisal) Inefficiency Procedures Training & development Obtaining qualifications Promotion Integrated Competency Framework (ICF) is now being used in a range of areas to: Give robust and defensible selection criteria for selection Focus training on the requirements of the role Allow staff to obtain a nationally recognised qualification, in recognition of their skills Allow for assessment of performance against activities and behaviours and the detail of NOS where required help and protect an individual and the line manager in inefficiency procedures by focusing effort on the actual requirements of the role give objective criteria for the required rank which can be assessed in the workplace, assessment centre or during interview Allow forces and managers to see whether there may be skills gaps (if no one is doing particular activities) and plan to fill that gap. 5 How can the Standards be used? Strategic perspective Looks at issues with a broad view to achieve the organisation’s goals. Thinks ahead and prepares for the future. (A, B or C) Openness to change Recognises and responds to the need for change, and uses it to improve organisational performance. (A, B or C) Negotiation and influencing Persuades and influences others using logic and reason. Sells the benefits of the position they are proposing, and negotiates to find solutions that everyone will accept. (A or B) Maximising potential Actively encourages and supports the development of people Motivates others to achieve organisational goals. 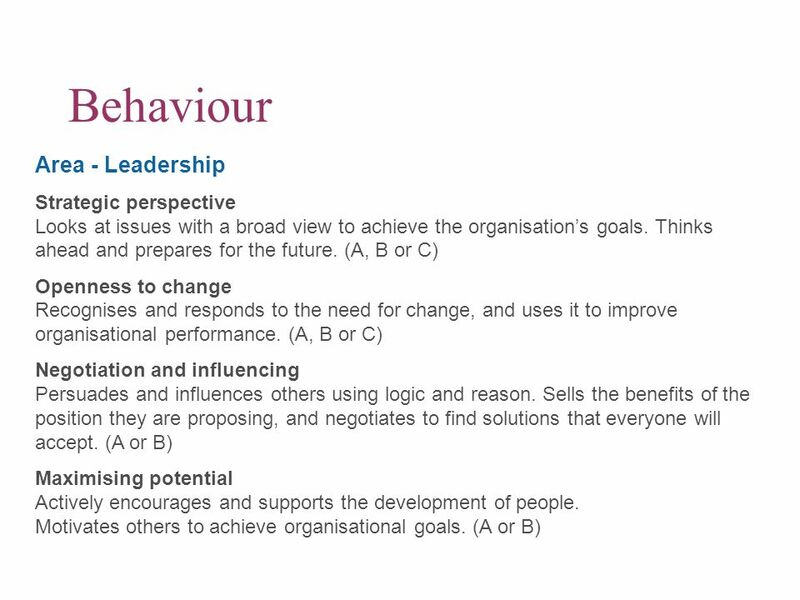 (A or B) The Behavioural Library is split into 3 broad areas – Leadership, Working with Others and Achieving Results. This slide illustrates the content of the Leadership area within the Behavioural Library. Within each broad area there are 4 Behavioural Competency Headings - each split into either 1, 2 or 3 categories. These categories are not rank or hierarchically related, but refer to the requirements of the role. 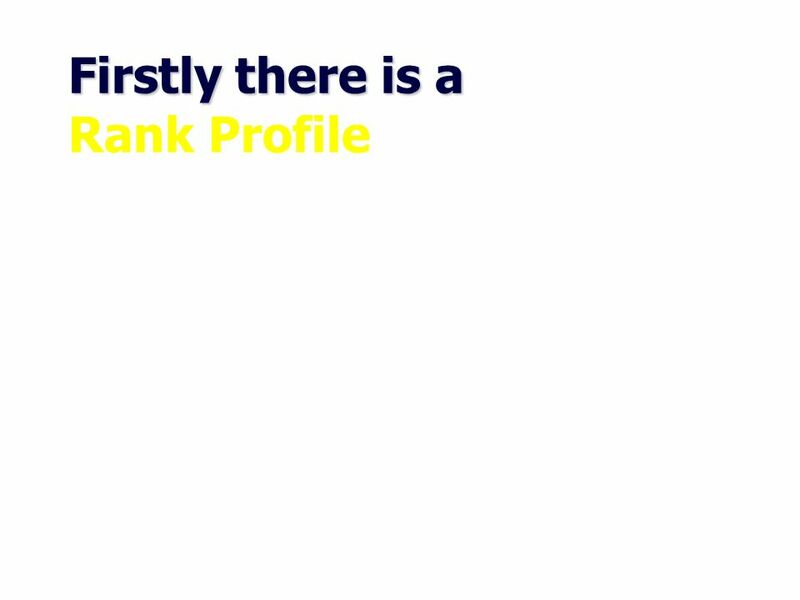 For example a PC may require category A in a particular behaviour because of their role whereas someone of higher rank would require a category B. The reason for the categories is that, for example, Strategic Perspective could mean different things to different roles and the categories allow us to be more specific about the needs of each particular role. Also there is not one behaviour called Leadership – but there is a behavioural area called Leadership. This area has four behavioural competencies which together define the behaviour of a leader. 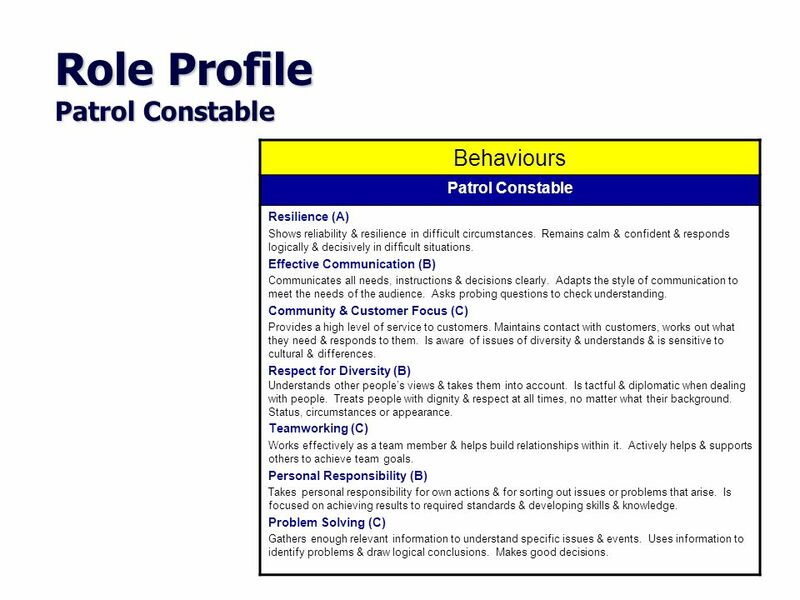 The Police Leadership Development Board and Professor Beverley Alimo-Metcalfe approved the combination of all of the 12 behavioural categories as demonstrating transformational leadership skills. There is a specific Respect for Diversity competency, this issue is also covered throughout the Behaviours and the Activities. 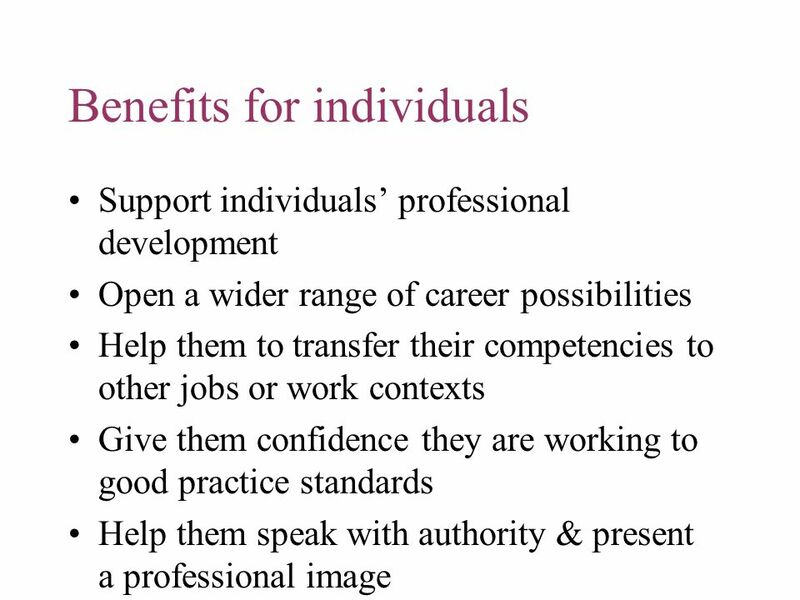 Support individuals’ professional development Open a wider range of career possibilities Help them to transfer their competencies to other jobs or work contexts Give them confidence they are working to good practice standards Help them speak with authority & present a professional image Provide nationally recognised qualifications National occupational standards provide a ready-made structure for individuals to plan and manage their own professional development. The standards clearly list the knowledge, understanding and skills required. Individuals can make sure they have these. The standards apply not just to one job, but to a number of different contexts, both within and outside the police sector. The standards show how knowledge, skills and competence can be transferred from one situation to another, opening up a wider range of job opportunities and career prospects. 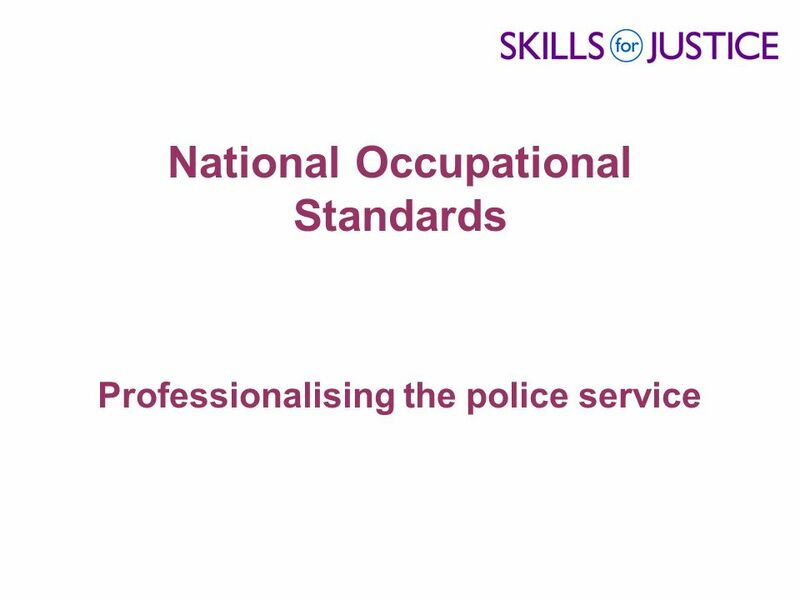 People working to national occupational standards are confident that they are doing the job to good practice standards, they can speak with authority about their work, present a professional image to colleagues and represent their organisation externally. Individuals’ competence can be recognised through NVQs or SVQs that prove they can do the job to the standards required. These qualifications are work-based so do not require individuals to spend extensive periods away on courses. Knowledge and Understanding Skills Units are introduced with a brief summary, describing the key aspects of the unit: what it is about, who it is for and how it was developed. Units are usually divided into two or more elements that describe the activities the person has to carry out. For example, Unit LA3 Develop and manage interviews with clients is divided into three elements: LA3.1 Enable clients to explore their problems and concerns LA3.2 Manage the interview process LA3.3 Bring interviews to an end. Each element contains clear statements that describe what workers must be able to do to perform effectively. For example, in Element LA3.1 Enable clients to explore their problems and concerns, the worker needs to be able to: Create an atmosphere and environment in which clients feel comfortable enough to express their problems and concerns Identify and recognise clients’ circumstances, responsibilities and priorities Provide clients with opportunities to explore their issues, etc National Occupational Standards also specify what people need to know and understand to do their jobs effectively. The knowledge and understanding for Element LA3.1 Enable clients to explore their problems and concerns include: The types of atmosphere and environment that are appropriate to different clients What situations could make clients feel uncomfortable and how to minimise them Organisational procedures for when a client is receiving advice and support from another agency and why it is important to establish this National Occupational Standards often specify the skills required to carry out the activity effectively. Someone working to Element LA3.1 Enable clients to explore their problems and concerns will need skills in, for, example: questioning active listening presenting information summarising reviewing and reflecting. 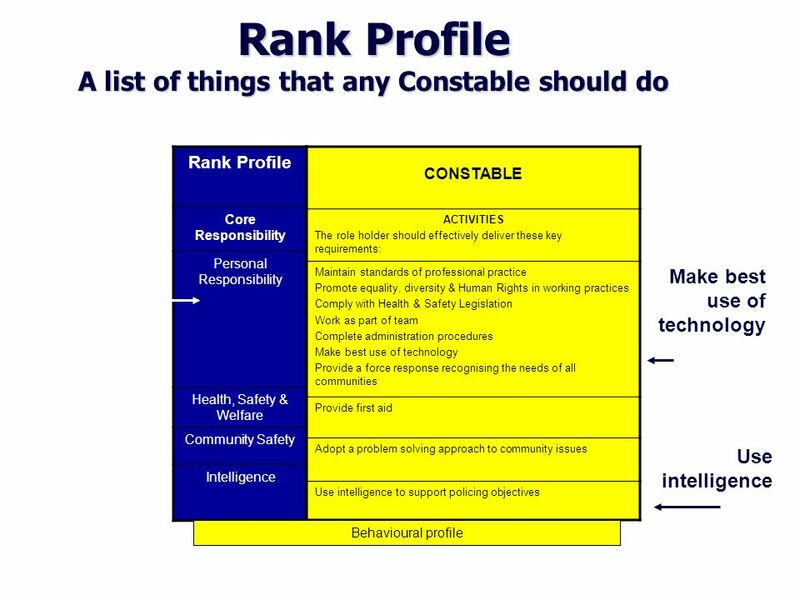 The Activities and Behaviours required by every person of that rank or grade Lets look at a specific rank, that of Constable Covers the 4 support staff levels as well. 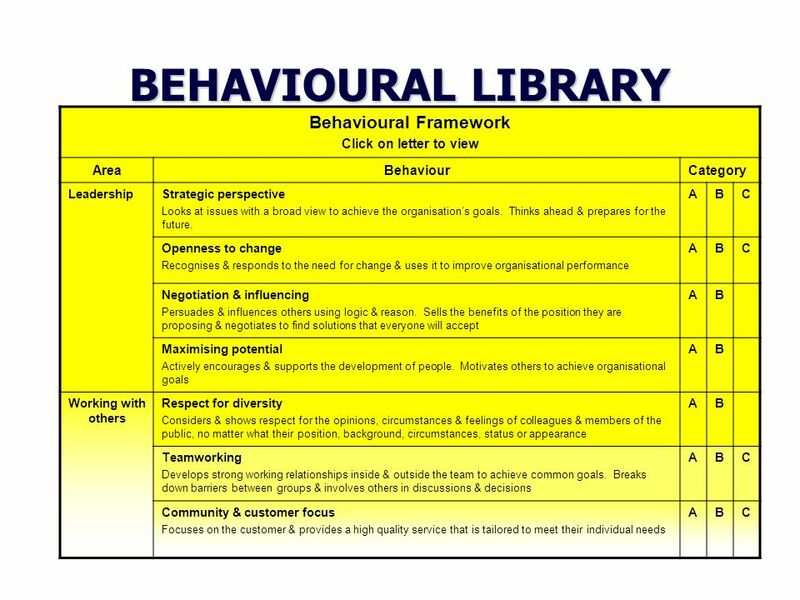 BEHAVIOURAL LIBRARY Behavioural Framework Click on letter to view Area Behaviour Category Leadership Strategic perspective Looks at issues with a broad view to achieve the organisation’s goals. Thinks ahead & prepares for the future. A B C Openness to change Recognises & responds to the need for change & uses it to improve organisational performance Negotiation & influencing Persuades & influences others using logic & reason. Sells the benefits of the position they are proposing & negotiates to find solutions that everyone will accept Maximising potential Actively encourages & supports the development of people. Motivates others to achieve organisational goals Working with others Respect for diversity Considers & shows respect for the opinions, circumstances & feelings of colleagues & members of the public, no matter what their position, background, circumstances, status or appearance Teamworking Develops strong working relationships inside & outside the team to achieve common goals. Breaks down barriers between groups & involves others in discussions & decisions Community & customer focus Focuses on the customer & provides a high quality service that is tailored to meet their individual needs The Behavioural Library is split into 3 broad areas – Leadership, Working with others and Achieving Results. There are 12 Competency Headings also split into either 2 or 3 categories. These categories are not rank or hierarchically related but refer to the requirements of the role. For example a PC may require category A because of their role whereas someone of higher rank or a specialist would require a category B.The reason for the categories is that, for example Strategic Perspective could mean different things to different roles and in having the categories this allowed us to be more specific. Also there are no specific competencies called Leadership – the research showed that leadership means different things to different people and is therefore covered throughout the framework. The same could be said of diversity and although there is a specific Respect for Diversity, this issue is covered throughout the behaviours and the Activities. Provide an initial response to incidents Respond promptly & take control of the incident by correctly identifying the nature of incident & take appropriate action to ensure that it is dealt with & recorded effectively. Effective performance will include the following: Where possible attend the incident within specified Charter Standard response times. Accurately identify the nature of the incident. Take immediate action in line with the nature of the incident. 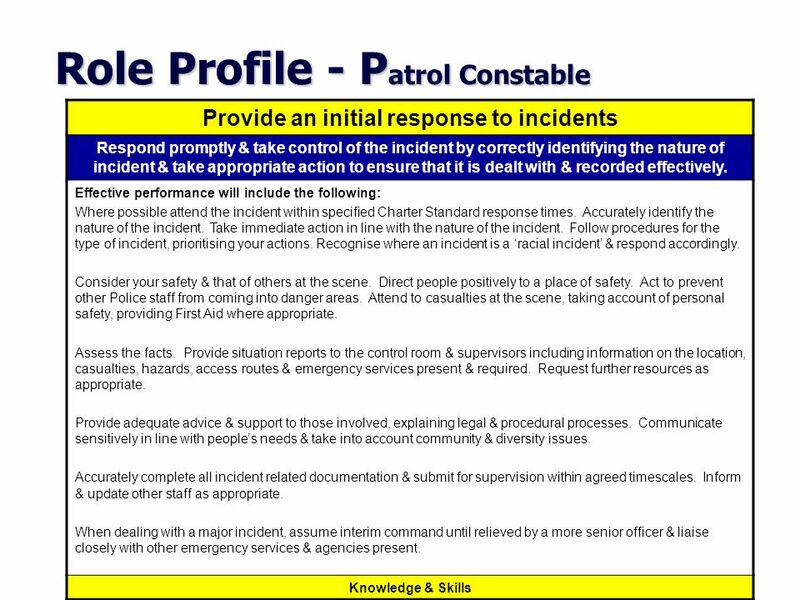 Follow procedures for the type of incident, prioritising your actions. Recognise where an incident is a ‘racial incident’ & respond accordingly. Consider your safety & that of others at the scene. Direct people positively to a place of safety. Act to prevent other Police staff from coming into danger areas. Attend to casualties at the scene, taking account of personal safety, providing First Aid where appropriate. Assess the facts. Provide situation reports to the control room & supervisors including information on the location, casualties, hazards, access routes & emergency services present & required. Request further resources as appropriate. Provide adequate advice & support to those involved, explaining legal & procedural processes. Communicate sensitively in line with people’s needs & take into account community & diversity issues. Accurately complete all incident related documentation & submit for supervision within agreed timescales. Inform & update other staff as appropriate. When dealing with a major incident, assume interim command until relieved by a more senior officer & liaise closely with other emergency services & agencies present. Knowledge & Skills Here is an example of one of those Activities. Each Activity includes a title, a definition and a description of effective performance which is not a minimum standard or visionary but built to be ‘achievable good practice’. At the bottom is a link to the Knowledge and Skills required for that Activity. 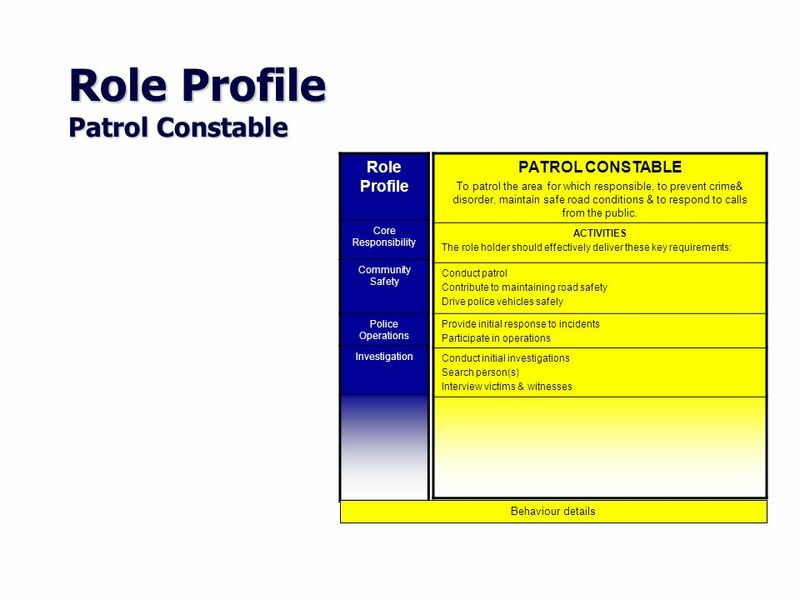 Behaviours Patrol Constable Resilience (A) Shows reliability & resilience in difficult circumstances. Remains calm & confident & responds logically & decisively in difficult situations. Effective Communication (B) Communicates all needs, instructions & decisions clearly. Adapts the style of communication to meet the needs of the audience. Asks probing questions to check understanding. Community & Customer Focus (C) Provides a high level of service to customers. Maintains contact with customers, works out what they need & responds to them. Is aware of issues of diversity & understands & is sensitive to cultural & differences. Respect for Diversity (B) Understands other people’s views & takes them into account. Is tactful & diplomatic when dealing with people. Treats people with dignity & respect at all times, no matter what their background. Status, circumstances or appearance. Teamworking (C) Works effectively as a team member & helps build relationships within it. Actively helps & supports others to achieve team goals. Personal Responsibility (B) Takes personal responsibility for own actions & for sorting out issues or problems that arise. Is focused on achieving results to required standards & developing skills & knowledge. Problem Solving (C) Gathers enough relevant information to understand specific issues & events. Uses information to identify problems & draw logical conclusions. Makes good decisions. Behaviours This is the Behavioural profile built from the library. Through further research we identified the prioritised behaviours for the ranks and roles which means that instead of having to use all the library, only these, in this case 7, behaviours are needed. The letters denote the required category so that for more detailed use, such as for selection or development the further detail can be used. 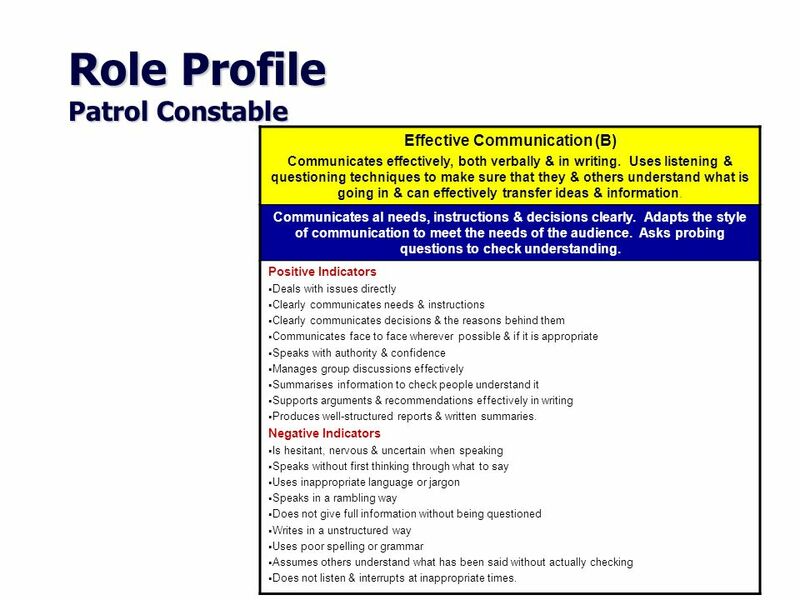 Effective Communication (B) Communicates effectively, both verbally & in writing. Uses listening & questioning techniques to make sure that they & others understand what is going in & can effectively transfer ideas & information. Communicates al needs, instructions & decisions clearly. Adapts the style of communication to meet the needs of the audience. Asks probing questions to check understanding. Positive Indicators Deals with issues directly Clearly communicates needs & instructions Clearly communicates decisions & the reasons behind them Communicates face to face wherever possible & if it is appropriate Speaks with authority & confidence Manages group discussions effectively Summarises information to check people understand it Supports arguments & recommendations effectively in writing Produces well-structured reports & written summaries. Negative Indicators Is hesitant, nervous & uncertain when speaking Speaks without first thinking through what to say Uses inappropriate language or jargon Speaks in a rambling way Does not give full information without being questioned Writes in a unstructured way Uses poor spelling or grammar Assumes others understand what has been said without actually checking Does not listen & interrupts at inappropriate times. Such as shown here in Communication - Category B. Each category shows a further definition and positive and negative behaviours. Each category within each competency has the same negative but different positive behaviours. The entire Behavioural framework has been subject to Plain English (crystal mark awarded) and adverse impact scrutiny for diversity issues. Negative indicators were included because line managers found them of use in helping to identify what someone was or was not doing and aids objectivity. They are though only indicators and not all would apply in some roles. For individuals, National Occupational Standards… support their professional development open up a wider range of career possibilities help employees to transfer their competence to other jobs or work contexts give employees confidence that they are working to best practice standards help employees to speak with authority and present a professional image Make clear the development requirements and improve fairness for selection For individuals, National Occupational Standards support their professional development open up a wider range of career possibilities help them transfer competence to other jobs or work contexts give them confidence they are working to best practice standards help them speak with authority and present a professional image. 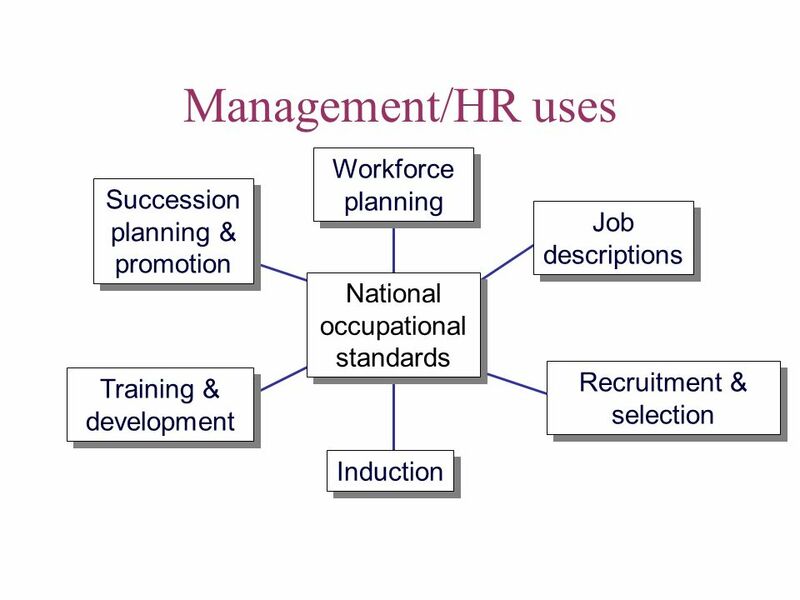 For line managers, National Occupational Standards… ensure their staff are clear about their responsibilities and competent to carry them out provide a ready-made framework for performance management and appraisal make assessment an integral part their work help employees to provide specific feedback designed to improve performance Allow employees to delegate responsibility to staff with confidence ensure their staff comply with legal and organisational requirements For line managers, National Occupational Standards ensure their staff are clear about their responsibilities and competent to carry them out provide a ready-made framework for performance management and appraisal make assessment an integral part their work help them provide specific feedback designed to improve performance allow them to delegate responsibility to staff with confidence ensure their staff comply with legal and organisational requirements. Improved quality of service by raising the motivation & skills base Standardisation with external organisations Align individual effort with organisational goals & targets Assure the quality required to win & regain contracts Enhance public confidence in the sector Benchmarking with other forces Strategic & coherent training provision Ready made tool for Performance Needs Analysis (T/PNA) Provide integrated structure for HR management and development This is all about improving skills and therefore organisational performance – e.g. arrest rates. Standards will allow for easier comparisons because many of them are common to other organisations. Will allow easier benchmarking with other forces e.g. what do their people do in particular roles and what are the benefits? If everyone had a development plan relevant to their role and this was captured organisationally – this would help provide a strategic development and training plan for the next year. Starting with the role profile when carrying out a training or performance needs analysis can save time and ensures that interviews with staff are focused on the organisational requirements of the role. Selection procedures are more efficient. 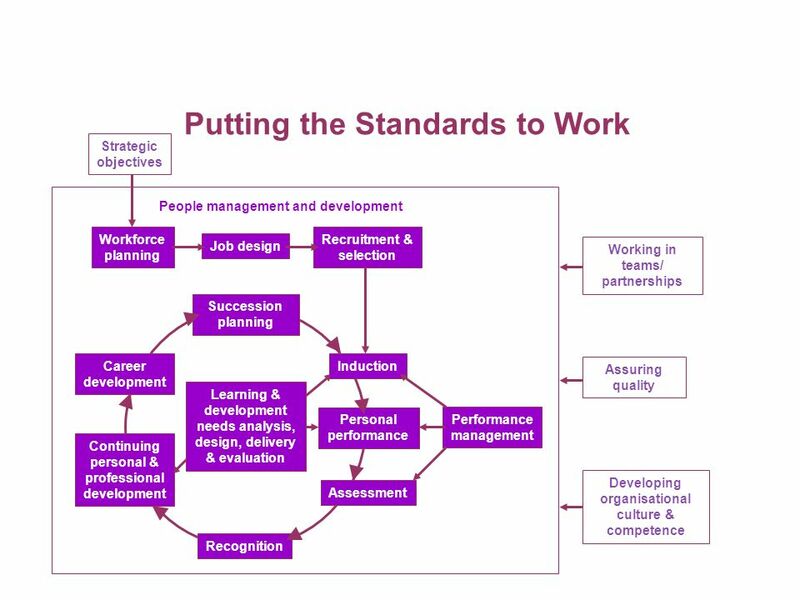 National occupational standards have been developed by employers, because they are critical to ensuring that every member of staff is contributing their full potential to achieving the organisation’s goals and targets. Organisations that do not deploy their human resources effectively and efficiently will quickly find themselves disadvantaged. The standards provide a ready-made framework for integrating all human resource management and development activities, ensuring the availability of a highly-skilled, multi-skilled, flexible and motivated workforce. National Occupational Standards help partnerships work more effectively as everyone can agree on common expectations, common standards and common measures of performance. They can also help to build public confidence in the organisation and the Police Sector as a whole. They help the public understand what the sector is trying to achieve and that it is committed to working to the highest professional standards. Download ppt "National Occupational Standards"
SAFE AND WELL Angela McKinnon Feb What is Safe and Well? A document building on previous guidance - part of the SE reform programme Supplement. Using the Workforce Capability Framework for Aboriginal Community Controlled Organisations Aboriginal Community Controlled Organisations. Delivering Protection.  Community expectations - protection, value for money  They expect the police to:  Prevent crime and disorder,  Respond to. Work-Based Learning (WBL) Coordination The Amended Model WORKLIFE COOPERATION PLAN Workplace analysis Workplace database Framework agreement Workplace. What Employers are Looking for in YOU!. Objectives Discuss key skills Employers look for in a successful Intern or New-hire. Discuss key skills Employers. Date: 2011 Presenter: Sarah Lean.  Determine job descriptions  Plan for selection  Assess and select applicants  Appoint and induct successful candidate. Fit to Learn Using the Employability Skills Framework to improve your performance at College The Employability Skills Framework has been developed by business. Changing Culture Marion Fanthorpe, Interim HR Director.